Check out below some words from people who have trained with us. 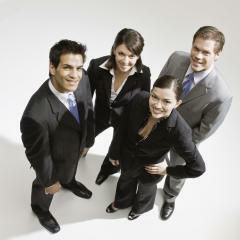 InDefence were very professional and friendly to deal with right from my initial enquiry. All of the attendees on the training day were women and found the training environment very friendly, and relaxed, I can put this down to the fact that Ash is an excellent instructor. The training session was very well structured with an equal emphasis on body and mind, delivering tools for defending ourselves against both verbal or physical attacks. Ash trained our members with passion and focused heavily on the right attitude towards conflict resolution. 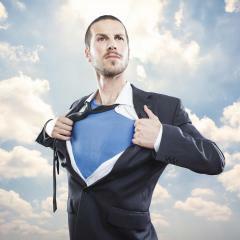 These skill will be very valuable not just for my members in a work environment but for life in general. All of the members loved the training session and have expressed interest to attend regular classes! I would highly recommend InDefence for anyone who is serious about their well-being. Hey Ash and Anna, just wanted to shoot you guys an email saying thank you for such a great weekend. It was brilliant from a start to finish. I walked in on day 1 with the firm belief I had no clue how to throw a strike or deal with an aggressor, what I ended up taking away with me and accomplishing blew me away. I can all ready feel a change in my mindset which is a big deal for me and am excited about continuing to push myself out of my comfort zone in my Krav training and every other aspect of my life. 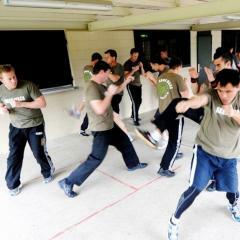 I first heard about Krav Maga whilst drinking at a bar in Jerusalem, Israel of all places, with some Israeli friends. One of my friends asked me “have you got any hobbies back in Australia?”. I told him I had started doing martial arts training in Kung Fu for about 10 months now. My Israeli friend, a former Israeli defence force soldier said had I heard of Krav Maga? I simply said no, and he smiled and showed me a video on youtube. I remember going wow, this looks incredible and was instantly hooked ! As soon as I got home, I found the InDefence website, signed up and came down. I’ve have had the pleasure of training under Ash for 3 years and have nothing but praise for his ability to start people on their Krav journey. Backed by a military background and decades working in the security industry , his expert ability and knowledge within Krav Maga is exceptional and only surpassed by his passion and dedication for passing it on to others. While the intensity of his advanced classes will challenge even the most seasoned martial artists, Ash also takes great care in providing a good induction of new students and makes sure that everyone feels welcomed and given a chance to find their feet especially if they haven’t done krav before. 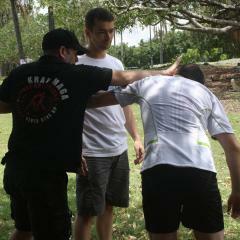 To have the opportunity to learn Krav from such a capacity right on The Coast is a privilege. Four years ago I was witness to a random attack on an individual at a function by somebody high on alcohol and drugs. I started to reflect that the victim could just as easily have been me. A short time later I overheard a business colleague talking enthusiastically about Krav Maga for self-defence and decided to check a class out. From the beginning I was hooked. The classes are a combination of cardio, strength and practical self-defence reflecting situations encountered on the street. Ash and his instructors from InDefence are committed to providing high standards of training delivered in an enjoyable and friendly atmosphere. I would recommend Krav Maga to anyone, irrespective of size, physical condition or age. It is an ideal means of learning how to protect yourself and loved ones, while simultaneously gaining fitness and self-confidence. 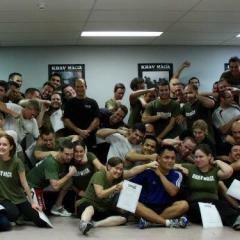 I started training in Krav Maga a good four years ago with Ash and Indefence and it has been an amazing experience. I have had so much fun since starting Krav; it has done wonders for my confidence, it makes me feel safer and I’ve made some great friends in the process. It’s fun and challenging and hard and really rewarding. It isn’t just training a couple of days a week, there are so many workshops throughout the year that are so well thought out and unique to Indefence; they have given me a chance to try things that I never would have otherwise. The instructors are awesome, and they each bring a unique view on Krav Maga that can really help round out your training. There is a wealth of knowledge available that comes with belonging to an organization as distinguished as Krav Maga Global and having the opportunity to learn from Eyal Yanilov really is priceless. The instructors are constantly improving their own training and knowledge which has a great flow on effect for the students. Krav Maga has the ability to positively affect every aspect of your life, from friends and family, work and careers, to travel and leisure. Travelling to Israel was something I had never even thought of before starting Krav, let alone travelling to Israel to train. We had such a fantastic group of people and with Ash and Anna at the helm it was a wonderful experience. So much more then just improving my Krav technique was gained. 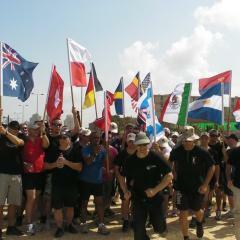 Travelling to Israel is just one of the many highlights I have experienced whilst being involved in Krav Maga. Others include Ash and Anna’s: Firearms Workshop, Krav vs Wild, Remote Island training, Close Quarter Combat, and many more. The best part is I know there is so much more to come, and I can’t wait to be involved in it. p.s I just renewed my passport. Whether you are interested in self-defense, building your self-confidence or just a great workout, the highly trained and certified instructors of InDefence will guide and support you every step of the way. Beyond the regularly scheduled classes at 3 different locations, Ash & Anna are constantly offering special workshops, additional training opportunities and social events. In my 3+ years training with the group, what stands out as most impressive is the group’s eagerness to embrace students old and new and of any ability level and background. 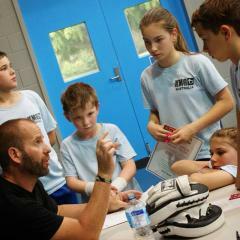 The individualised attention to each student’s goals and interests far exceeds my previous experiences with similar types of training. I started training with InDefence in August 2008 because of a neighbour who was probably suffering from a mental illness & /or alcohol problem. He had a history of violence with 2 other residents, both of whom were too scared to go to the police. He was making my life hell. Things had deteriorated over a period of about 18 months. He started with weird accusations, progressed to verbal abuse and finally was really getting in my face with awful threats of violence. His behaviour was erratic and very aggressive. My family and friends told me to just rise above it, but he became more aggressive and deranged as time went by. I tried to avoid him. I was sneaking up and down the stairwell and holding my breath each time I passed his door. Still, he regularly cornered me on the stairs. It was the first time in my life that I had to deal with a genuine ongoing violent threat – and I was scared. I went to the police, who were sympathetic, but wouldn’t do anything because I hadn’t suffered any actual physical injuries. Insufficient evidence they said. I felt really let down. I started boxing, which helped, but I continued to have doubts – what if he caught me in a tight space? What if he grabs me around the throat? What if he has a knife? So I jumped onto google. There I stumbled across Krav Maga. It appealed to me because it was realistic and fast to learn – no mystical techniques that would take years to master. I vividly remember my first class. I rocked up to Runaway Bay wearing my board shorts and a tee shirt and told Anna and Ash why I was there. Ash teamed me up with a senior student. I was nervous, but anxious to get started. By the end of the first class I was blocking punches and knife stabs with my bare hands. I was amazed. I then arranged some private lessons with Ash, during which the constant fear, frustration and anger I had been living with came to the surface. 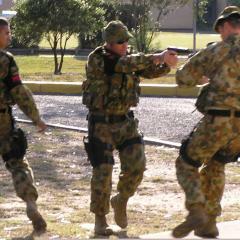 We practiced defences to attacks I could face in a confined space by training in a public toilet block. Additionally, Ash spoke about verbally dealing with my neighbour. At last I was getting the help I needed! After about 12 classes (six weeks training) I felt I was reasonably well equipped to deal with a variety of attacks. However, being a non aggressive person, I was concerned as to whether I would use my new skills and whether I could overcome my fear. But through various drills, the Instructors taught me how to deal with my fear, how to turn the fear into aggression if I needed it, and how to switch my aggression on and off. I can still hear Anna’s voice yelling encouragement to me during those early drills. One day my bully neighbour was again screaming that he and his son were going to punch my lights out. I had had enough and this time I was ready. I told him to stop talking about it and just do it. He was visibly shocked and backed off, but continued to abuse me and give me his ‘death stare’ once in a while. Each time I was ready for him. He now leaves me alone completely – happy days! I can not recommend InDefence highly enough. Great Instructors. Great people to train with. Our aim was to find the best self defence solution for our teenager. This desire arose from what seems to be an alarming increase in ‘coward punch’ and other unprovoked attacks on innocent young people. Krav was initially recommended to us by a martial arts expert friend who suggested that Krav draws from the most effective elements from other arts and then distills them into practical techniques and approaches that will work in real life. We have been pleased to see it impart capability so quickly, and also offer great flexibility for people to learn just the survival basics, or to dig far deeper and progress through grading etc if they wish to. Our son has now acquired an impressive level of confidence with a range self defence techniques (both physically and psychologically). This would have taken far longer to acquire with other forms or self defence / martial art and perhaps also be far less applicable to real life situations. In addition to this we have admired how Krav teaches good situational awareness for avoiding conflict in the first place, and then the quite devastating techniques to survive and not become the victim if conflict cannot be averted. 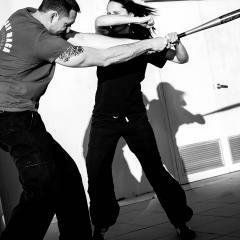 Krav with InDefence is oriented to real world threats and scenarios with very friendly and professional instruction. We have no hesitation in recommending it based on our experiences.